I analyse the long term trends in the UK weather using a statistical tool known as Standardisation. 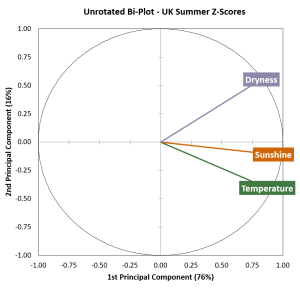 This means that the 3 key variables of Temperature, Sunshine and Rainfall are recalculated so that they all have the same units, which is number of standard deviations above or below the mean. Such variables are known as Z-Scores which by definition will have a mean value of 0 and a standard deviation of 1. For more information on how I have done this, please read my post on trends in the UK summer of 2017. The Z-Scores for Temperature, Sunshine and Rainfall are shown in the 3 charts below. Each chart also contains an 11-year centred moving average which gives an idea of the underlying trend. Standardised variables aid interpretation of data in many ways. If the standardised value is positive, it means that the value is above your average or expected value. If it is negative, then the value is below your expected value. If the original variable is approximately normal in its distribution then the vertical scale gives us an idea of how typical or atypical each year is. Z-Scores in the range -1 to +1 are considered typical values and completely unremarkable. Z-scores in the ranges -2 to -1 and +1 to +2 are considered to be uncommon values but still entirely plausible and such values should not cause us concern. When Z-Scores get into the ranges -3 to -2 and +2 to +3, we should start paying closer attention and asking ourselves if something has changed especially if we get a sequence of successive points in these ranges. Finally, if the Z-scores are less than -3 or greater than +3, that is normally regarded as a clear call to action. There are in fact many ways of interpreting Z-Scores and what I have said so far merely a gives an overview of the most basic interpretations. 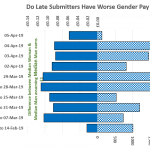 A whole field of study known as Statistical Process Control (SPC) is dedicated to building and interpreting such charts (known as Control Charts). For the summer of 2018, the z-scores for temperature, sunshine and rainfall were respectively +2.0, +1.9 and -1.0. So across all three dimensions, the summer was 1 to 2 standard deviations away from the mean indicating a very untypical summer. If you have been following my monthly weather tracker then you will know that August was unremarkable whilst June and July were hot, dry and sunny. Since the 3 moving averages in the above 3 charts all use the same units, they can be plotted onto the same chart as below. 1915-1970 – we had cold and damp summers. 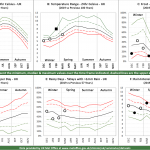 1970-1995 – we had dryer and almost normal temperature summers. 1995-today – a clear shift in our climate occurred to warm and wet summers. How many dimensions does Summer have? The long term trends chart above suggests that the z-scores for temperature, sunshine and rainfall all appear to be correlated. In fact this can be illusory as the above chart uses moving averages. If we look at the actual z-scores, we can see what the correlation is in the 3 scatter plots below. 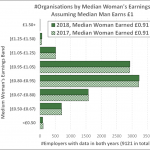 The brown square in each chart is 2018. 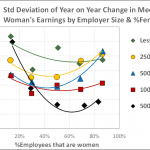 Scatter plots can be useful to identify unusual years that do not follow the normal relationships. Here we see that 2018 was completely consistent with historical scatters. Looking at the 3 scatter plots in turn, we see that all 3 variables are correlated with each other. A statistician would look at these charts and say that what at first appears to be 3-dimensional data (temperature, sunshine and rainfall being the 3 dimensions) is in fact closer to be being 1-dimensional. This new dimension would be a weighted average of these 3 z-scores known as a Component. There are in fact many possible weighted averages of the z-scores (components) that could be used and in my Spring 2018 Trends post, I introduced the method of PCA (Principal Components Analysis) which can take our 3-dimensional data set, calculate 3 new components that are statistically uncorrelated with each other, and with the property that the first component would account for the greatest possible share of the total 3-dimensional variance and thereby reducing the effective dimensionality of the data to 2 or even 1 dimension. Please do read that post if you need to familiarise yourself with PCA. The Correlation Bi-Plot shows the correlation of the original variables (3 z-scores in this instance) with the two new principal components PC1 & PC2. Each axis label shows how much the components account for of the total variance and since the total of these values is less than 100%, this warns us that the bi-plot is still an approximation of the entire dataset and therefore some information is missing. Despite that, it is still very informative. Note, for ease of interpretion, I have replaced Rainfall with Dryness where Dryness is just the negative of Rainfall i.e. Rainfall multiplied by -1. You can see that PC1 is highly positively correlated with Sunshine since the Sunshine label is almost at +1 on the PC1 axis. Temperature is also positively correlated with PC1 but not quite as strongly as Sunshine. Finally, Dryness is well correlated with PC1 and is also correlated with PC2. 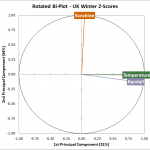 So this tells us that the UK Summer 1st Principal Component is basically an average of the 3 z-scores with slightly more weight given to Sunshine. The more positive PC1 is, the better our summer and the more negative PC1 is, the worse our summer. Let’s not forget that Principal Components are by definition uncorrelated with each other, which means you can analyse each component independently. The bi-plot tells us that the 2nd Principal Component is basically the difference between the Dryness Z-Score and the Temperature Z-Score. So when PC2 is positive this indicates the summer is dry and cool and when it is negative, it is warm and wet. However, PC2 only accounts for 16% of the total variance so from now on, I will ignore this and concentrate on PC1. Using PC1 to Predict UK Summers! The great value of PCA is that we can look at long term trends in our climate using a single index. I have done this for PC1 in the chart below. The scale used is similar to the z-score concept. 0 represents the long term average, positive numbers above average and negative numbers below average. The numbers themselves broadly correspond to the number of standard deviations above or below average. When I first performed PCA on UK summer data after 2003, I was startled to see an apparent pattern emerging. My understanding of weather is that long term predictions are not possible and yet our good summers seemed to coming every 6 to 8 years. 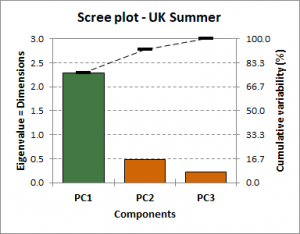 If we define a good summer to be one where PC1 is greater than 2 (as highlighted by the green checked bars in the chart), the first thing that is clear is that the good summers seem to be discontinuous from our other summers. By this I mean, there are very few summers with PC1 values between 1 & 2. More notably, the gaps between the good summers did not appear to be random as shown in the chart to the left. Either the next good summer came straightaway or we had to wait 6 or 7 for the next one. It was this chart that prompted to say all and sundry that 2018 would not be a good summer! Our previous good summer was in 2013 so adding 6/7 years implied that our next summer would be 2019/20. However I had forgotten that 1989 came 5 years after 1984 whereas I had been counting that year as 6 years after 1983. 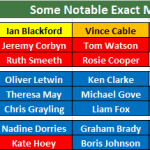 Of course we can now add an extra sun to the 5th row of the chart. A final point from the PC1 chart. The long term trend as shown by the black line shows a clear shift in the 1970s to better summers. However, there has been no discernible trend since then. I think this is an extremely important point to bear in mind when discussing the effect of Global Warming on the UK. Our summers have not been getting warmer and warmer. Instead, they underwent a step change in the 1970s but have not had any noticeable trend since. In fact, it appears that the main effect of Global Warming on the UK has been warmer winters most of all. 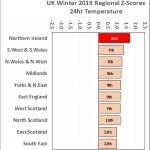 Therefore, if we are trying to anticipate future climate change in the UK and how to adapt, we should not be expecting warmer and warmer summers. The summer of 2018 set some new records but it does not mean that all of our summers in the future are going to be like that and the UK will continue to have poor summers as well. If you want to read my other Weather Trends posts, please click on the link or the Weather Trends hashtag below this post. Otherwise, please click the relevant season from the list below.